and four part webisode series for Florida Power and Light. These are some of the images that inspired my design process. 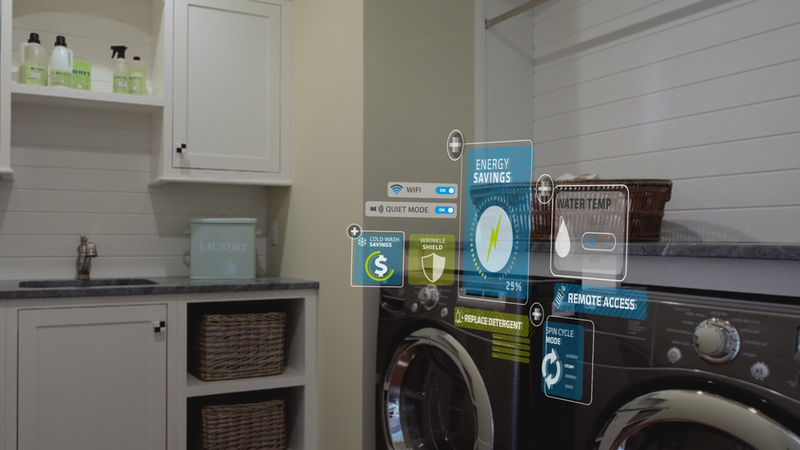 The main goal of the project was to show how smart appliances could help save you money on your energy bill if your service is Florida Power and Light. These are some preliminary frames that where done for the first spot Smart Home. After discussing the frames with the Creative Director we decided the graphics weren't legible enough for the client preview and went with a solid background to bring out the information and graphics. We ended up using the Florida Power and Light brand colors as our main color palette. The project consisted of three different parts that we were responsible for; three television commercials, a four part webisode short series, and an augmented reality presentation that I was responsible for designing ( I did not code the augmented reality or see it in action at the convention ) I focused mainly on designing the core assets and helping with animation on the three commercial spots. In the webisode series I was responsible for designing the graphic assets, the introduction, and helping oversee the visual effects finishing to help keep the graphics consistent with the broadcast commercial.